This may come as a surprise to those who think of Dubuffet as a practitioner of “art brut” – otherwise known as outsider art, or the art of the insane and untutored – which he also supported and collected from the late 1940s. While popularly collected by Dubuffet, the late Monika Kinley (creator of the Outsider Art Archive now at the Whitworth Art Gallery in Manchester), or more recently, James Brett of the Museum of Everything, art brut has never commanded particularly high prices. But Dubuffet was always much more than an outsider artist. In 1949 the influential American critic Clement Greenberg declared him to be “perhaps the one new painter of real importance to have appeared on the scene in Paris in the last decade”. Shaping opinion beyond the auction rooms, there was the recreated mental asylum interspersed with Dubuffet paintings on the Helly Nahmad stand at Frieze Masters last year; an important exhibition of his early work currently at the Acquavella Gallery in New York, and a prestigious retrospective exhibition now at the Beyeler Foundation in Basel, Switzerland. Leslie Waddington died six months ago, and his mantle, in some respects, has been taken up by dealer Timothy Taylor, who worked for him for many years. Taylor has built a reputation dealing not only with younger artists, but also the older generation from the School of Paris – Antoni Tapies, Hans Hartung and Simon Hantai among them. He represents the estates of these major artists who have died, and presents their later work in the same context as their younger contemporaries. But Dubuffet’s estate is handled by the bigger Acquavella and Pace galleries. To do a show of Dubuffet, Taylor has put his money where his mouth is. At the moment, possibly because he is married to a member of the royal family, Lady Helen Windsor, he is receiving unwanted attention because he has complained about disruptive building work at his Mayfair gallery by the landlords. But let no one be distracted by that. For his next show he is presenting a collection of late woks by Dubuffet, from the 1960s until his death in the early 1980s, which he has been building assiduously for 20 years. 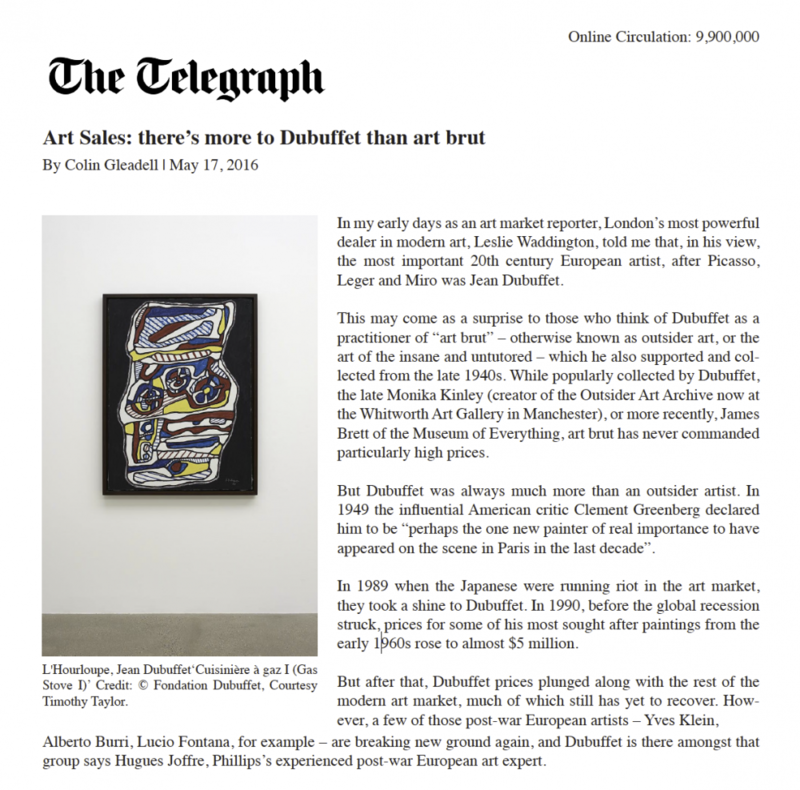 Starting when the market was weak, the collection has continued into the new phase of the Dubuffet market. Taylor’s show is not only timely, but fills part of the jigsaw which the other shows have missed or are missing by focussing on the late work. “It doesn’t have much to do with ‘art brut’,” says Taylor. For those who are not aware of the variety of series Dubuffet pursued in later life, here we have entrancing examples from his Theatres des Memoires, like mosaics of madness; the so called Hourloupes (a word he made up while doodling on a telephone pad) that take you diving in and out of happily meandering forms of black, red, and blue lines; and the non-figurative, “non lieu” paintings of entangled lines, like Jackson Pollock, in the same bright but limited colour range.